Wmiprvse.exe is a system process manufactured by Microsoft, whose process name is Microsoft Windows Management Instrumentation. Such executable process is created to guarantee proper operation of WMI (Windows Management Instrumentation) by inquiring and configuring the information on Windows desktop, applications, networks and other subassemblies. Microsoft Windows Management Instrumentation (WMI) is a shared ServiceHost that governs several services simultaneously. With the increasing demand on comprehensive and powerful functions, the possibility that a provider fails is growing. To avoid this, Wmiprvse.exe is pushed by Microsoft as a distributed host process to load a provider severally. Why It Consumes High CPU? There are several reasons for Wmiprvse.exe to hog limited computer resource. 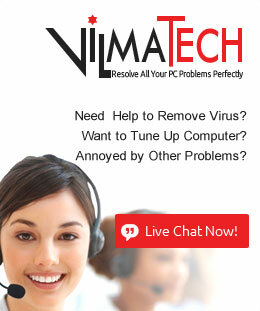 A specialized technician from VilmaTech Online Support lists down detailed reasons in the following paragraphs. It is advisable to finish reading. Should you have questions, you are welcome to start a live chat window for answers here. Wmiprvse.exe is also a useful process for experienced developers to create event monitoring applications for the effective prevention of infections. However, once Wmiprvse.exe is affected by infections, it will be utilized to configure information to make certain program (browsers particularly) work maliciously and monitor applications for information theft. Generally speaking, the genuine Wmiprvse.exe is put under c:\windows\System32/wbem; Wmiprvse.exe in other directory is recommended to remove. Since Wmiprvse.exe plays a very important role in maintaining proper running of the machine, extra carefulness is required when removing it. In the network marketing era, more and more operators turn to utilize web applications to promote sales. To prevent PC users from being bombarded, anti-virus programs are programmed to monitor web site, plug-ins, emails and the like, which undoubtedly puts extra pressure on a system. The help posted on Firefox forum is a good example. Decreasing the number of monitor service or updating hardware is recommended. Uncertified version of drivers is mostly the one modified by PC users well equipped with computer skills with a thirst for more functions. In other word, more services will run at the same time when corresponding hardware is used. 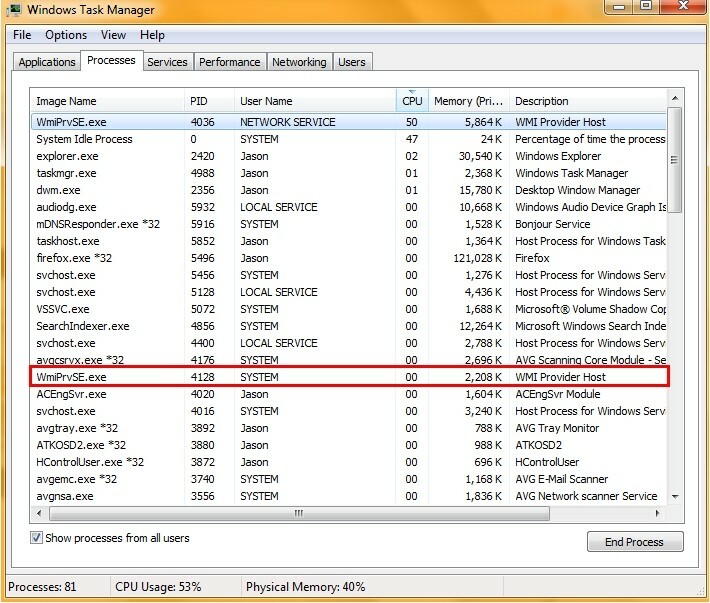 Thus more svchost.exe will appear in the Task manager, which will increase the consumption of CPU. To check if there’s a problem on installed driver, one is suggested to check if there’s any question mark/exclamation mark under “Device Manager” (“My Computer”/”Computer” -> “Property” -> “Hardware” -> “Device Manager”); to identify if installed driver fits current OS well, one is recommended to use “msinfo32” command to access “System Information” and check model NO. under “System Drivers” of “Software Environment”. The first two reasons are the primary ones for high consumption by Wmiprvse.exe process. To see which is the reason to make Wmiprvse.exe consume high CPU, one is recommended to check the service correspondingly under Service. In most cases, the occurrence of Wmiprvse.exe error indicate the fact that Wmiprvse.exe being re-written or corrupted by infections. There are also occasions where incompatibility happens, which can be incurred between device drivers and systems or installed programs. Since some steps have been offered in the preceding paragraphs to rule out the possibility to cause Wmiprvse.exe issue, the blow instruction is provided mainly to help resolve the problem evocated by virus affection. Please bear in mind that no slight deviation is allowed or unexpected computer problems will be incurred. If you are poorly equipped with computer knowledge, consult VilmaTech Online Support, real-time help will be offered just in time. Use command line to debug wmiprvse.exe. Use Win+R key combination to type “CMD” (without quotation) in the pop-up Run box. Hit Enter key and you will get a little black window with flashing line/ slash. Disable Wmiprvse.exe with suspicious service to implement subsequent steps. Right click on “My Computer”/”Computers” on the Desktop to select Management/Government in the drop-down list. Unfold “Service and Applications” menu on the left pane. Select Service to find “Windows Management Instrumentation” on the right pane. Check its service by clicking once on Wmiprvse.exe. Right click on the Wmiprvse.exe with suspicious service to choose “Disable” option. 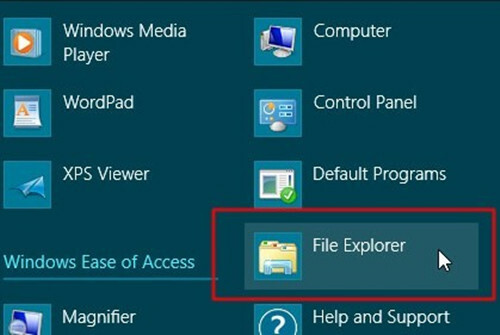 Access Windows Explorer on Start screen and choose Administrative tools. 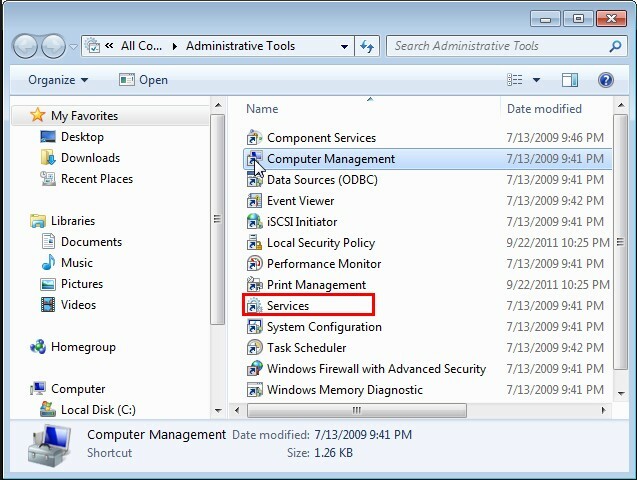 Double click on Services icon to find Wmiprvse.exe. Click once on the detected Wmiprvse.exe files respectively to check service. Right click on the Wmiprvse.exe with suspicious service to remove/disable it. Show hidden items and files to remove Wmiprvse.exe file from local disk. Access Windows Explorer to tap View tab. Tick ‘File name extensions’ and ‘Hidden items’ options to unveil hidden items. Unfold Start menu to access Control Panel. 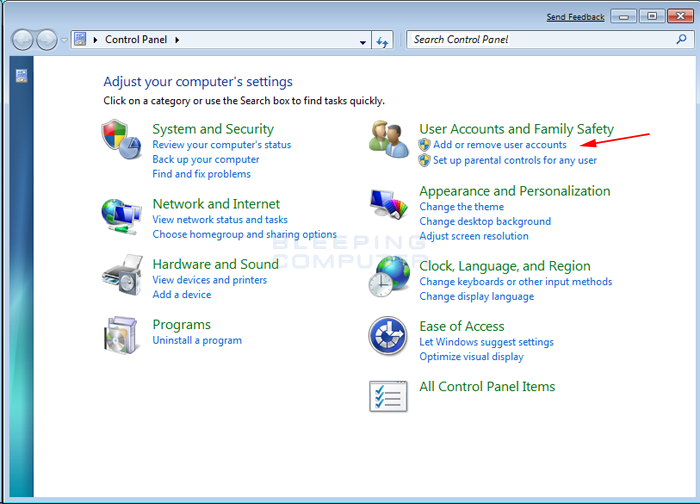 Choose ‘user accounts and family safety’ so as to bring up ‘Folder Options’ window. Tap View tab to tick ‘Show hidden files and folders and non-tick ‘Hide protected operating system files (Recommended)’ to unveil hidden items. When done, navigate to C:\Windows and C:\Windows\System32 to remove any indication of Wmiprvse.exe file. The Wmiprvse.exe fix session is finished here, one should go to remove the culpable virus now; otherwise Wmiprvse.exe problem may stage a comeback. Error messages would constantly popup. Multiple indications of Wmiprvse.exe show in Task Manager to consume resource considerably to make a zombie machine. Default homepage might be replaced by other unknown program without permission and change. The overall PC performance becomes sluggish to ruin experience and decrease efficiency. A large amount of junks and unknown items are mounted onto the system without permission. Of course there are other reasons to cause Wmiprvse.exe error and high CPU consumption, such as incompatibility, uncertified drivers, large amount of plug-ins. In the end, VilmaTech Online Support hopes that this article would make you informed and help you resolve tangled Wmiprvse.exe issue. If you encounter additional difficulties that are not stated in this article and don’t know how to handle, you are welcome to resort professional assistance by starting a live chat window here.